The Santa Fe based artist Willy Bo Richardson completed his MFA in painting from Pratt Institute NY in 2000. 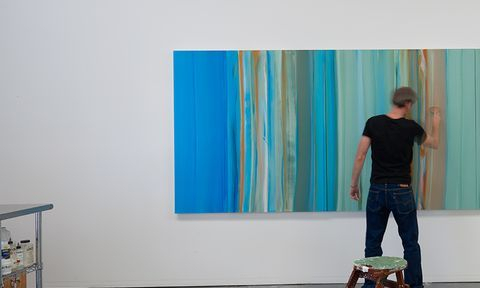 Since then, his lusciously intense, and immersive color field paintings on aluminum, canvas and paper have received considerable critical and commercial success. 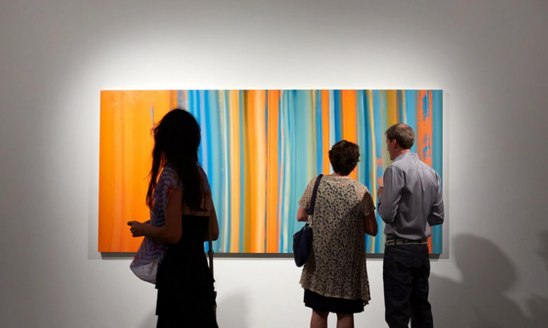 The work resonates with the bold history of geometric abstraction and a more conceptual approach to painting. Despite the dazzle of intense, luminous pigmentation, carefully built layers and translucent oil glazes, the work offers unique visual experiences to viewers that defy easy explanation and categorization. Willy Bo Richardson’s technique borrows from the Dutch tradition of layered oil painting –– building images from lean to fat –– , but his preferred current painting substrates are large-scale aluminum panels, a thoroughly industrial material, rather than the stretched canvases of old. Also his color palette is more at home with a jazzy mix of 1980s neons and day-glo colors than the more muted and carefully orchestrated hues of the old masters. Despite a very carefully developed and complex painting technique - and its avoidance of the flat color field approach of many contemporary painters - the work is firmly modernist and of our time. By providing intense visual experiences to the viewer, this work places itself among other notable artists who likewise found tremendous inspiration in the spaces, light and atmosphere of New Mexico, and found new ways to place the experience of color at the center of their practice: Agnes Martin, Georgia O’Keefe, and James Turrell, to name but a few. And In ‘Specific Objects’ Donald Judd, another lover of the Southern light, wrote: ‘Half or more of the best new work in the last few years has been neither painting nor sculpture. Usually it has been related, closely or distantly, to one or the other’. 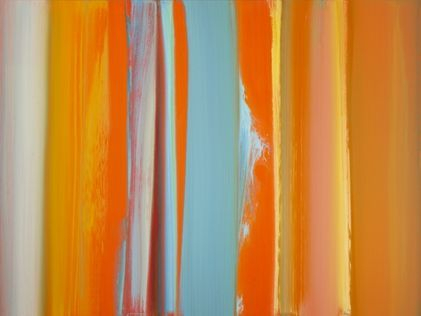 Perhaps, one of the most important artists Richardson takes inspiration from is Mark Rothko, both in terms of a luminous color field approach, and in his painting technique. and the myths from which they have stemmed'. about what he was doing on canvas." 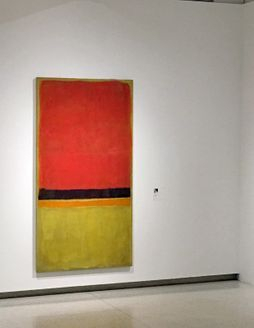 Below is a link to our essay 'Rothko's methods revealed' by Jane Qui, first published in 'Nature', which gives astonishing new scientific insights into Rothko's innovative approach to painting, and his unique use of glazes, translucent layers, and painting mediums. 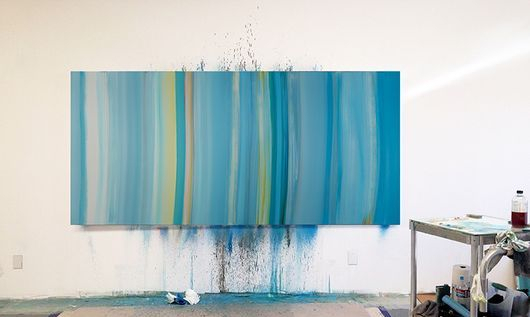 "That's Where You Need to Be"
Others point to the musical nature of the work: ‘Using watercolors and oil, Richardson paints vertical lines with uneven brushstrokes, rendered precisely so that each stroke reads as intentional. 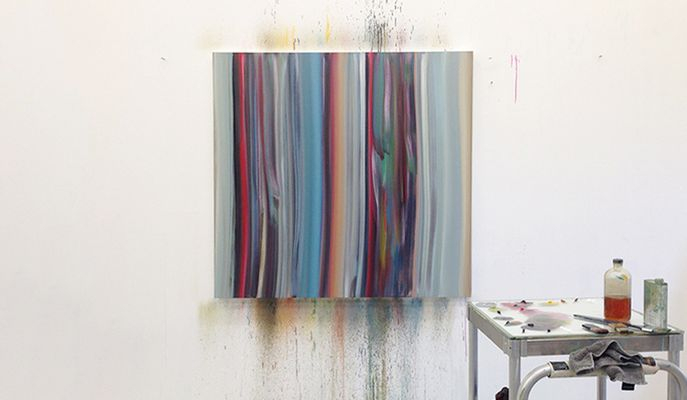 In his works on both canvas and paper the oil paint seems to flow quite smoothly—showing no signs of being clogged by the teethy texture canvas often offers. Richardson’s naming schema seems especially Kandinsky-esque in form, as he frequently references music, and the synesthetic associations between sight and sound. In this way, Richardson’s dedication to verticality and use of vibrant colors seem especially significant in a sonic sense.’ (Artsy). 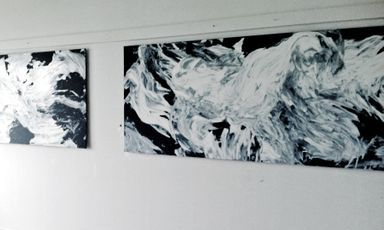 Many artists seeking — and often finding — freedom of expression also encounter constraints of a different kind: many of the known art making materials and processes entail numerous chemical and physical hazards threatening the artist’s health, through frequent and prolonged exposure to toxins. In the following, the artist shares his recent experiences with these issues. I learned general health and safety practices working as a painting tech at Cooper Union in New York for 7 years, and then teaching as an adjunct professor in Santa Fe for 7 years. I always wished to have safe studio habits, but was often lazy in my own studio, and university ventilation systems and practices were not adequate. Many of the solvents and mediums artists use would be taken much more seriously in a science lab. Unfortunately, I come from the generation that was taught to paint with damar, stand oil and turpentine. I explored many mediums over the years, including products from the hardware store. Eventually I settled on an alkyd medium and odorless mineral sprits (OMS). I explored less toxic alternatives, but wasn’t happy with the results and stuck with what I knew. Old habits and inertia landed me in the middle of a health crisis. It was after I became sensitized to solvents that safety in the studio became priority number one. Now I can only paint with the highest standard for low toxicity and safe studio practices. Otherwise I will quickly become light headed and go home with a headache and nausea. So I’m not working with theories. If I mess up, I’m sick. I am currently able to work with oil paints and mediums in a traditional way while inhaling a minimal amount of fumes toxic OMS. I would like to share some of what I’ve learned about safe studio practices. I don’t consider myself an expert. Some of what I know may be outdated or incorrect. I am learning as time goes on and wish to have a completely non-toxic studio in the future. February, last year, I taught a painting class on color theory, and oil glaze techniques at Santa Fe University. Early in the semester I went home with a headache and nausea. I hadn’t exposed myself to anything unusual that day. The next morning, I woke up with what felt like a hangover, and from that day on I could no longer set foot in my painting classroom without feeling sick the rest of the day. I also could no longer enter my own studio! I had become sensitized to the solvents and cleaning agents used in my painting practice. My life turned upside-down, as I learned to cope with the sudden onset of these new physical ailments related to my work. Aside from the emotions of fearing I may never paint again, I became physically sick when I walked down the detergent isle at a grocery store, entered a mechanic shop, or inadvertently set foot in a room where someone was painting their nails. On the worst day, I simply walked past the janitor cleaning cart at my daughter’s school and subsequently felt sick for hours afterwards. As well as nausea and headache, I had the new experience of my reptilian brain’s fight or flight response, along with “brain fog,” which felt like early onset dementia. You can imagine this past year was quite a ride. I revamped the painting studios at the school — switched students to a solvent-free painting medium and canola oil for washing brushes. However, I did not want to short change my class, so I continued to teach a traditional technique that required small amounts of mineral spirits to build “lean to fat” glaze layers of oil. To avoid consistent nausea and headaches, I finished up (what would ultimately be my last semester teaching at SFUAD) with the students painting en plein air. I changed my own studio practices too: solvent-free mediums, new ventilation system, and a respirator when working long hours or working on large surfaces with mineral spirits. Thankfully I had guidance from chemist, artist, and one of our nation’s leading experts in industrial hygiene, Monona Rossol. I met Monona when she was consulting SFUAD, and then by chance sat next to her on the red-eye to New York. She is a national treasure and worth looking up. One of the known, and more obvious, cures to chemical sensitivity is to stay away from chemicals. For nearly six months, I spent as much time as possible in fresh air, both hiking and skiing. Sounds like fun right? I relied on a surplus of paintings in my studio to sustain my income. (Fortunately, 2016 was my best year ever in sales!). I sought out the healing council of friends, and had an unexpected encounter with a Lakota heyoka when I was in Standing Rock, ND last Fall. I am further convinced this is a shared dream, and any situation can be transformed. Within the past two months, I have only had one episode, which is a major improvement. I was in my studio, starting to get brain fog and went home feeling sick. It didn’t make sense because I was working with watercolors that week. I called my studio neighbors to inquire and was surprised to hear, “nothing toxic going on over here, just cleaning floors with plain ol’ bleach and Fabuloso.” Bingo! I will assume all my readers understand the level of toxicity in those two products, especially combined. I bought my neighbors non-toxic cleaners. Problem solved. Today, I am happy to say that my condition has improved and is now manageable. I have new rules about diet, studio practice and lifestyle, but I am — for the most part — back in action! I no longer wonder, Will I feel sick today? Also during the time away from my studio, I was able to reflect on my work and put new energy into my vision and career. I became inspired to work on new, long-term projects, which are currently in motion but I cannot announce yet. Be ready for exciting news! "So glad you found the answer to your feeling sick, willy…not your paints but your studio neighbors’ cleaning. a friend of mine, who had painted with oils for 30 years, did become very allergic to the solvents and, even after installing a whole air filtering system, he found he could not paint. 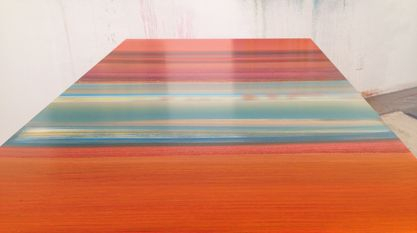 So, he worked with grumbacher to develop an oil like paint without having to use solvents." It’s amazing how commonplace it is for artists and people in roofing, house painting, construction, theater and other fields to become sensitized to toxic solvents and cleaners. It’s also disappointing that art schools do not take this more seriously. If we were working with the exact same products in a university science lab, proper ventilation and other health and safety issues would be a priority. I’m familiar with the Grumbacher water based oil paints, and we experimented with them in my class. They are quite good for certain types of painting. They tend to dry darker than when wet, but that’s manageable. The place where they don’t work is if the artist wants to build up transparent glaze layers. The pigment has to end up suspended in a dried oil film, and water simply evaporates. So one can still do thin layers, but not glaze layers. The solvent free medium I use is made by Gamblin and is new since just last year. The technology is catching up to where painters can work in less toxic environments. It will take some time for the culture to catch up. Unbelievable that when I was in undergrad we were working with turpentine and Damar etc. One of the reasons I wrote this, was to advocate for safer studio practices. That’s quite a story, Willy, and I am encouraged by your ending! I too had a close friend, college professor, who developed a reaction to turps — long ago, before alternative solvents were around. She sadly did give up oil painting and I’ve always remembered this. She was such an incredible oil painter… I’ll mention that we often overlook our skin, which is a permeable and vulnerable organ. I use a barrier creme in the studio, in addition to the other protective layers. Makes a difference! WR: When I taught an intro to painting class, I felt one of the most valuable lessons I could teach was glaze techniques. Working from “lean to fat” brings transparent layers that yield exciting color combinations, and a fine tuned value spectrum. Scumbling, wet on wet, working with a palette knife and other painting techniques can be learned with trial and error. However, glazing requires a vocabulary and planning. By the middle of the first semester, students I taught would know exactly what to do when the assignment asked for a warm ground, a cool value study and a set of complementary color glaze layers. FK: Willy, can you give details of the solvent free mediums you are now using, or any similar new development you may be aware of? 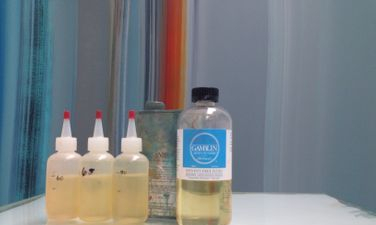 WR: I use Gamblin’s Solvent-Free Fluid, which came to the market just a few years ago. It’s made from safflower oil and an alkyd resin with no solvent. Painters who simply want to thin their oils straight out of the tube may use this medium without any additional solvent. This medium can be safely used in a studio with no ventilation. The solvent-free fluid is 100 percent fatty. I paint lean to fat, so I dilute the fluid with OMS to get desired solutions. My first glaze layer is 60% fat (60% solvent-free, 40% OMS). Subsequent layers will have less OMS, more fat. There are no “safe” solvents. All solvents, natural or synthetic are toxic. So I have a simple ventilation system of fans in air-tight window boxes. There is a steady flow of air from the intake fan, across my studio, to my palette and drying paintings which are close to the exhaust fan. I also wear a half mask respirator with organic vapor cartridges. The solvent-free fluid can replace Gamblin’s alkyd medium, with some modifications. It’s not as forgiving as alkyd, and works best on a stable surface like wood or aluminum panels. It dries very slowly, so I have to wait a full 5-7 days between painting layers. The final result is also more delicate. Aside from all these tricky aspects, I like the way the paintings look in the end. FK: Can you give more recommendations for oil painters working with thin washes, layers, and glazes. What alternative solvents are available, and which ones work well? WR: There are a lot of options for people who aren’t using a glaze technique. Less options for those who want to build transparent layers. I was not thorough in researching different brands, so I can’t speak about the full range of oil medium products. When I became sensitized to solvents I was using Gamblin products at the time, spent a good amount of time with them on the phone and found solutions within the Gamblin product line. There are other good companies out there that are striving to create less toxic solutions for painters. A few years ago I had my students explore M Graham walnut oil and alkyd medium. Walnut oil can be used much like linseed oil, and the alkyd medium is solvent free. Walnut alkyd (5%), in combination with walnut oil, creates a painting medium meant to be used sparingly in relation to paint. It dries in about 24 hours but remains tacky for days. The walnut oil can go rancid in a year or two, so don't buy a gallon of it. The MSDS sheet does not reveal a lot, but states both are non-toxic. Both the walnut oil and alkyd medium are worth taking a look at, and are mediums I may personally explore again. FK: This is really interesting. In printmaking we've also introduced various food-grade oils into the process (for example sunflower oil is now commonly used for cleaning up inks and rollers), but most of these can spoil after a certain period and should not be mixed with the oils used in the printing inks. I know some of the makers of safer inks, such as soy or starch based inks, are experimenting with using preservatives to counteract these effects. WR: Yes, it’s also wise to look at safe brush cleaning practices. Safflower and even grocery store bought canola oil can be used instead of mineral spirits. When using food grade oils, keep in mind this is to be used at the end of the day. An artist grade safflower or walnut oil is best when cleaning brushes between sessions. You don’t want grocery store oils to end up in your painting. They will never dry, or may yield unexpected results. Some friends recommend washing brushes with baby oil, which I don’t have experience with. FK: Some print studios are using baby oil (mineral oil) for various cleaning jobs, as it does not smell or go rancid. But claims from the 90s that it's 'non-toxic' haven't been confirmed. Skin contact should be avoided (as ingested baby oil can damage internal organs), and I would wear gloves when using it. Also there are residual VOCs that may be harmful. When it comes to the care of an actual baby's skin, I would avoid mineral oil and use a skin-care product made from olive oil instead. WR: I am also sensitive to harsh cleaning agents, so I only use a mild dish soap and Master’s Brush cleaner to clean my brushes after the oil. Some people believe Simple Green is a non-toxic or less toxic cleaning agent. It’s not. Don’t let the word “green” fool you. Also, Gojo, Fast Orange and other citrus based cleaning agents and solvents are toxic. Citrus and pine based cleaners contain volatile chemicals that form formaldehyde vapors when they react with ozone. Also, just as one should never mix bleach with ammonia, because the combination creates dangerous chloramine vapors, artists should not wash brushes with OMS and heavy duty cleaning agents such as simple green. Artists have access to a very dangerous science lab. For this reason, I recommend using non-toxic cleaners for brushes, tools and for the studio floor and other surfaces. It goes without saying that everyone must wear nitrile or latex gloves in the studio. All it takes is a tiny amount of cadmium under the fingernail to get on your hamburger at lunch to yield cadmium storing itself in the base of your spine for the rest of your life. FK: What about the new water-miscible oils, etc.? WR: Some artist friends speak highly of the water-miscible oils. It’s an oil paint engineered to be thinned and cleaned up with water. I explored the Holbein Duo Aqua and Winsor & Newton Artisan water mixable oil colors in my studio. I also ran experiments with these oils with students in my classroom. I am personally not enthusiastic with the results. The paint tends to dry darker than when wet. Of course one can get used to this. The main issue I have is that one can’t truly make glaze layers with water. Pigments must be suspended in a fatty oil film to get a certain desired effect. When water evaporates, pigments simply settle. If you want to do a true glazing technique with water-miscible oils, you have to use their “water-miscible” glaze mediums, which are toxic, so we’re back to square one. As a side note, people often think they can safely use acrylics without ventilation. Acrylics have Ammonia and Propylene Glycol. An open window is usually enough, but I don’t recommend living and sleeping close to drying acrylic paintings. FK: Yes, after 25 years of close involvement with acrylics, I can confirm that. All acrylics can be expected to contain some harmful VOCs, and even some reputable 'nontoxic' products have been found to contain toxic ingredients that may not be listed by the art stores. In my own painting practice with acrylics I use fans for ventilation and wear a carbon-filter paper mask that can remove 95% of VOCs. FK: If the artist thinks, petro-chemical solvent use –– say with Naptha or OMS –– cannot be avoided for a certain technique, what ventilation/extraction solutions plus respiratory protection do you find is best? WR: The air in the studio should be completely exchanged in a certain amount of time, based on the toxicity of the solvent, amount of solvent used and cubic feet of the room. The air change in my studio is every 10 minutes. I have two 800 CFM fans - one drawing fresh air in, and the other sucking out. Dilution ventilation is not as ideal as special ventilation from hoods and vented counters. Because I only have general ventilation I always wear a respirator when working with OMS. When working with solvents an organic vapor cartridge should be used with a half mask respirator. I tried a few brands until I found one that fit comfortably for hours. A fit test should be quickly done every time you put it on. Also the cartridges are only good for a period of time. I put mine in a ziplock bag between painting sessions. FK: By the way: have you tried orange-oil base solvents with oils, (now they even make a food-grade variety), and also: what do you make of spike lavender oil which is becoming popular? I experimented quite a bit with orange oil, and considering this is made from orange peel, it's chemical properties are impressive and useful for certain applications. But there definitely is an inhalation hazard if there is exposure to undiluted vapors of this. Orange oil should really be treated as a powerful chemical, not as a harmless oil that could go into salad dressing. WR: Oil of spike lavender is a natural solvent. Citrus solvents and other natural solvents are becoming popular. Unfortunately the word “natural” is a marketing ploy. Petroleum is natural too, since it's plant and animal matter buried under the earth for a period of time. A solvent is an organic chemical that that dissolves other materials and evaporates quickly and cleanly. Some solvents are less toxic than others, but all solvents are toxic and must be handled accordingly. The damage caused can accumulate and be permanent. There are many claims that oil of spike lavender is non-toxic. I don’t know how a solvent can dissolve damar, and be non-toxic. If it’s true, sign me up! The words 'non-toxic' can also be misleading in our greed-driven economy. An art medium or solvent can be certified non-toxic through ASTM D4236, but according to this labelling law untested equals non-toxic. Manufacturers can freely label untested chemicals as 'certified non-toxic'. It's important that art educators are motivated to really learn about chemicals they use and teach with, and how to properly read an SDS and labels. People have a right to understand what is both known and not known. FK: Yes, I couldn't agree more. Professional artists engage with such complex chemistries, yet often do so with insufficient care and knowledge. Even experts and safety organizations frequently change their recommendations about hazards, health effects, and safe(r) practices. Caution is by far the better principle than carelessness. In my experience, safety recommendations used in Sweden or California –– two places with strong awareness and regulations –– exceed what is commonly published, ...or unpublished. We will continue this very interesting and relevant discussion on the merit of alternative solvents and mediums, and publish an update –– presenting a variety of expert contributions –– later this year. Willie, could you share a few thoughts and a quick technical guide to oil glazes, the modern way? Many artists and schools use our resources and would be keen to know. Just an overview would suffice for now. WR: We often use the word “traditional” when talking about building up glaze layers. The better word would be “practical.” A graffiti artist working with spray paint works much in the same way. Both start with a ground color. Next comes a loose fitting value study, in which basic shapes and values are established. This looser layer is an opportunity to look at the whole picture, before committing to final figure boundaries and lines. With subsequent layers, the focus turns to tightening shapes and developing higher contrast, or more refined value changes. The finishing and last layers are where the artist gives the work 'bling', final touches –– the brightest brights and darkest darks. Also, some may believe that working in this practical way dictates a “traditional” subject matter. I want my students to learn painting techniques while being excited about their work and personal style and creative thinking. I encourage my Freshman students to bring in what excites them the most … Japanese manga, total abstraction, still-life, graphic images, loose images, classical still-life –– whatever their heart desires! Of course working from still-life as opposed to copying a picture has it’s merits, but if a student is super excited to work out ideas on their phone or computer, I encourage them to do that. Excitement comes from ownership and unique expression. I want my students to have fun and love what they do. FK: Thank you so much, Willy for giving this so much thought. WR: Thank you for this wonderful opportunity!